Today, we are implementing the MageTest/MageSpec Module based on PHPSpec toolset. In this implementation, we have two different tests taken from the Magecasts tutorials. The first one is to understand how PHPSpec works. “We will look at PHPspec and how we can use it to enhance our development workflow”. What are we doing here? 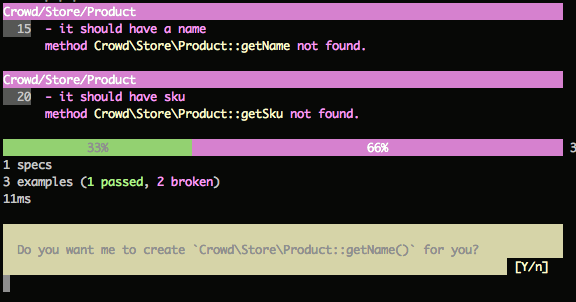 Well, we are defining two more test functions. One to check if a function called getName() returns a string with value “Testing Spec” and the other to check if a function called getSku() returns a string with value “12345”. What does this mean? First of all, PHPSpec checks if getName() and getSku() functions exists in the Product class. If it does not find them, it asks us if we want to create them. Once created, PHPSpec will try to run the tests, but they will not pass. And… oh!, they don’t pass again. Why? And we did it, friends! How Accurate Are Your Estimations?